Thus General Ulysses Simpson Grant was nominated to be President of the United States of America at the Republican National Convention. The date was May 21, 1868. The place: the great Crosby Opera House in Chicago. It was a glorious occasion and a great honor to have the opera house used as the place where this American Hero was nominated to the highest office in the land. But it was not the first time great excitement had been felt within the walls of this magnificent structure. Nor would it be the last. There had been the grand opening. 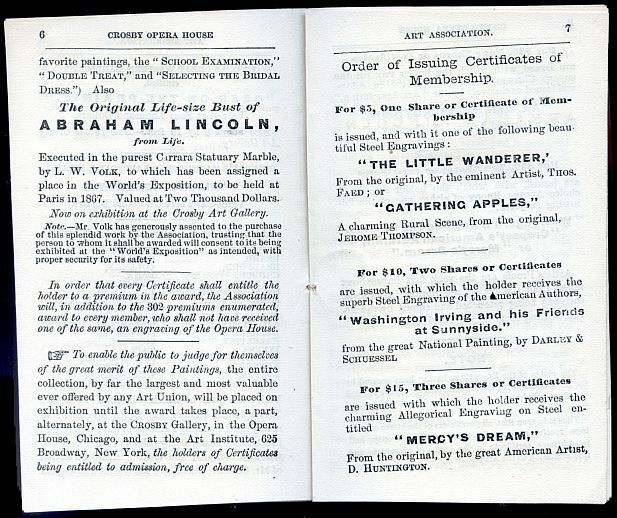 It was to take place on April 17, 1865 with a presentation of Italian grand opera. But the assassination of President Lincoln three nights before caused a delay until April 20th. When the opening night did occur “a brilliant assembly of society heard `II Trovatore’ and marveled at the splendor of the place. Needless to say there had been great excitement in October, 1871, when the dreams of U.H. Crosby went up in smoke. Whether it was Mrs. O’Leary’s cow or some other source, the conflagration destroyed about 18,000 buildings over an area of approximately 2,000 acres. The Crosby Opera House certainly must have been one of the most spectacular edifices to have perished. But there was another very exciting time for Crosby’s. It culminated on the 1st of October, 1866. And before it was over, thousands were involved in a “lottery” which has provided us with one of the most fascinating pieces of revenue stamped paper ever to have been produced. The story is an interesting one. country. What resulted was the Crosby Opera House. 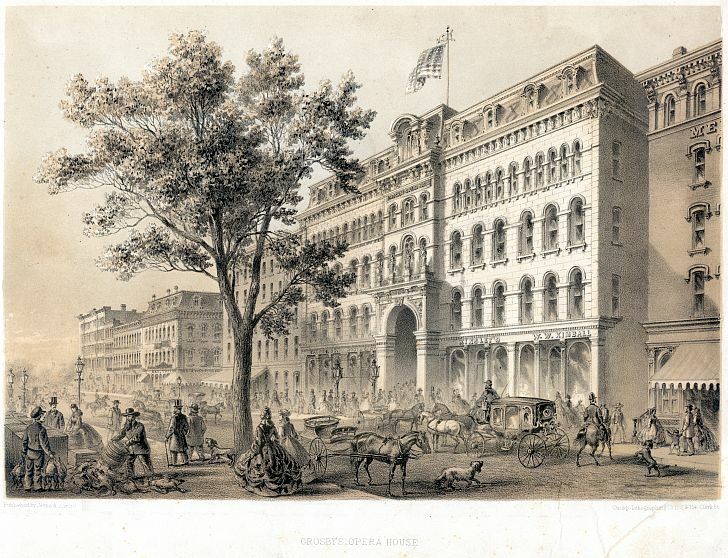 Located on the north side of Washington Street, between State and Dearborn, it was indeed a fabulous and lavish structure. Figures 1 and 2. 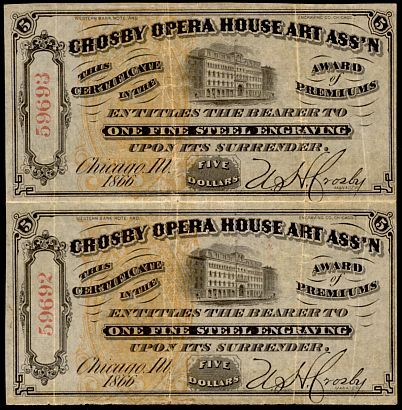 A set of four consecutively-numbered Crosby Opera House Art Association certificates and the receipt, dated August 22, 1866 which accompanied them. The imprinted revenue stamp, an RN-P5 in orange, paid the required five cent federal tax on a certificate. 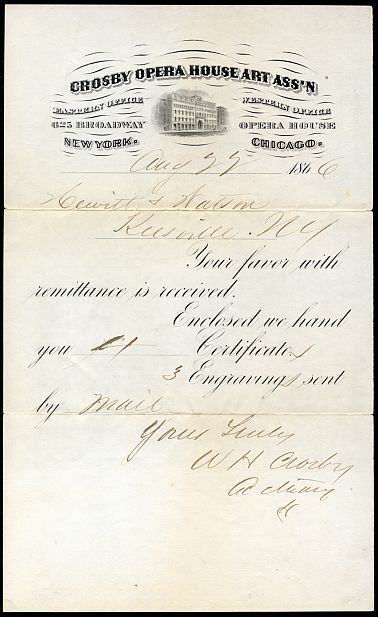 The “certificate” was carefully worded, as was the prospectus, to avoid any mention of the word “lottery.” These certificates were delivered to a firm in Keesville (sic), New York. What brought this great civic project to such a desperate point? And how was it to be retrieved? Thousands of beautifully produced certificates were sold for $5 each. They promised to award each holder with a fine steel engraving. Actually, in addition, the purchaser had a chance to win one of three hundred and two prizes. There were 301 very significant pieces of art, including a number of oil paintings by renowned artists and an original life-size bust of Abraham Lincoln in carrara marble. But the grand prize was the actual Opera House itself! 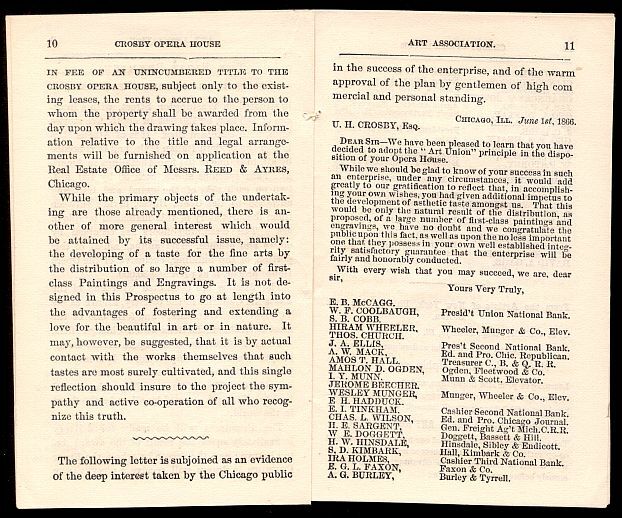 “Most of the purchasers lived in Chicago, but nearly every state in the Union was represented. As the day for the drawing approached expectancy was on tiptoe. Hotels were jammed with incoming holders of certificates. Hundreds slept in saloons and railroad stations the night of 30 September, 1866*. The next day there was a terrific crush at the opera house when the doors were thrown open. 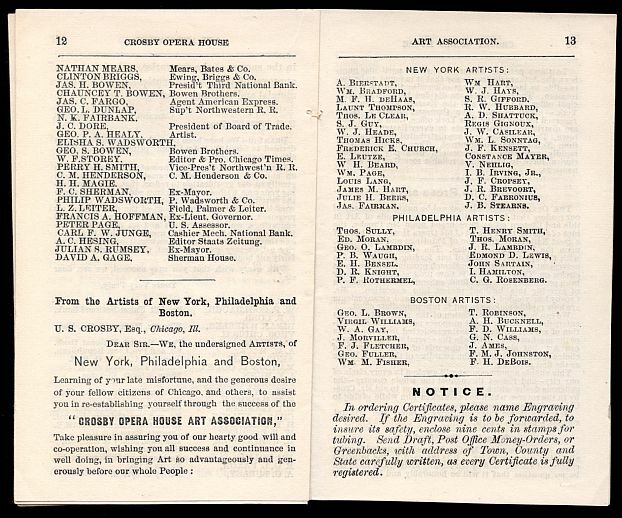 “The drawing on the stage was under the supervision of a committee of staid business men from Chicago, Boston, New York, Philadelphia, Saint Louis, Detroit and Fall River, Massachusetts. In one great revolving device 210,000 numbered cards were placed. In a small one were 302 tickets, representing as many articles to be raffled. 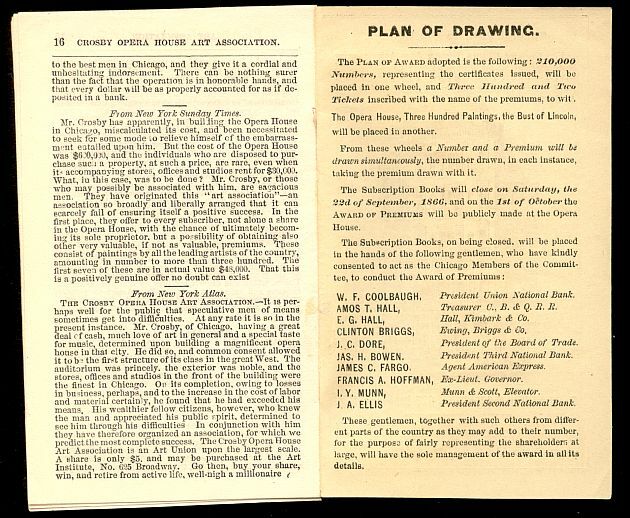 Drawings from each were made simultaneously, the holder of the drawn ticket from the large wheel being in each case the winner of the prize designated by the number on the ticket of the other wheel. 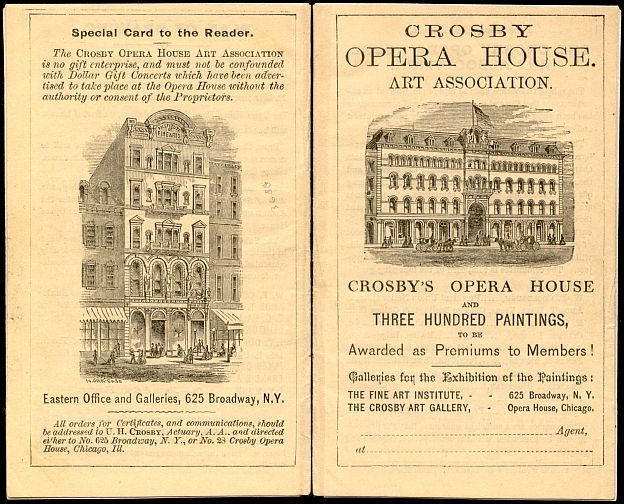 “Excitement was intense when, well on in the drawing, ticket 58,600 called for the grand prize, the Crosby Opera House. The holder of the lucky number was not present, but he proved to be A.H. Lee, of Prairie du Rocher, Illinois. * Incorrectly stated in the original as January 20. 1. McFeely, William S., Grant: A Biography, W.W. Norton & Co., New York, 1981, p. 277, being a direct quote from the New York Herald, May 16 1868. 2. 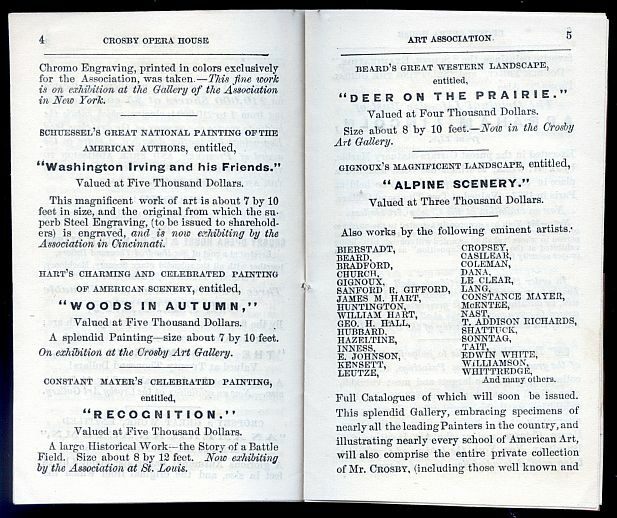 Hills, Frank K., “Editorial Comments and Current Topics,” Weekly Philatelic Gossip, Vol. X, No. 40 (Jan 2, 1926), p. 960. 3. 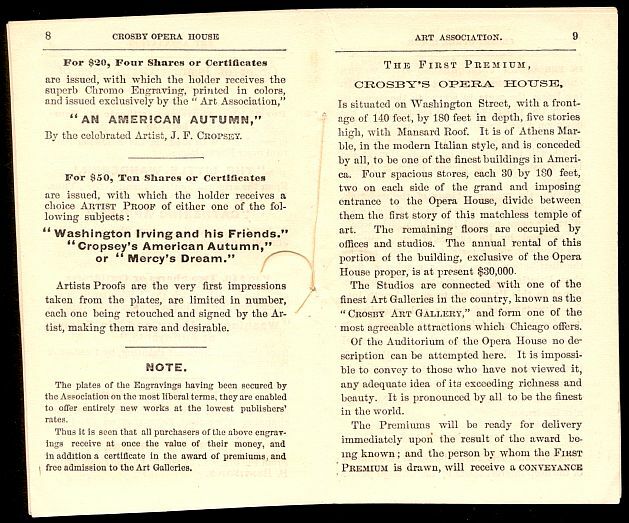 Crosby Opera House Art Association (prospectus describing the “lottery”), no date (circa 1866). 4. Hills, Frank K., “Editorial Comments and Current Topics,” Weekly Philatelic Gossip, Vol. X, No. 40 (Jan 16 2, 1926), p. 961. Figure 3. 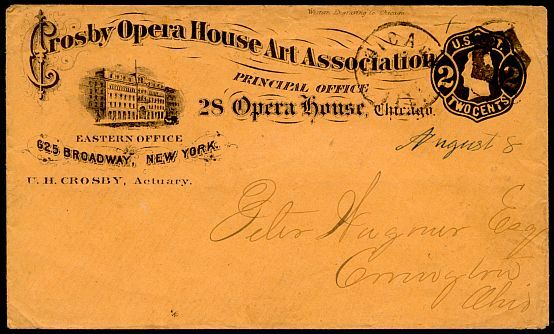 The envelope used to mail the brochure describing the scheme at the circular rate of two cents. It is a stamped envelope of the Jackson Die 3 type issued in 1864. Figure 4. 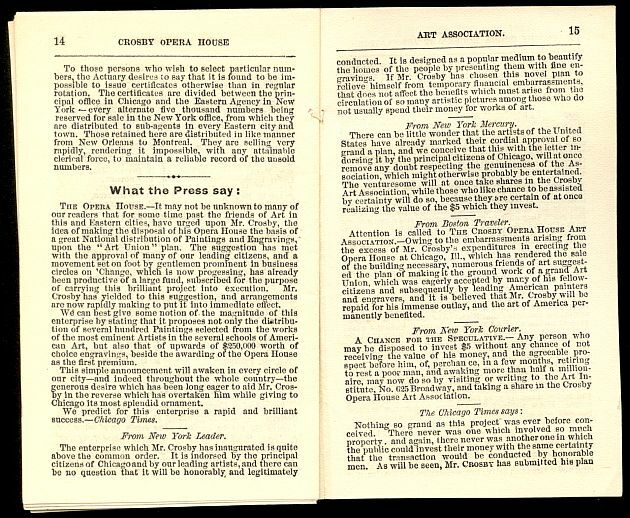 The back and front covers of an eighteen-page prospectus outlining the reason for, and method of disposal of, the art objects and the opera house itself. Figures 5 and 6. 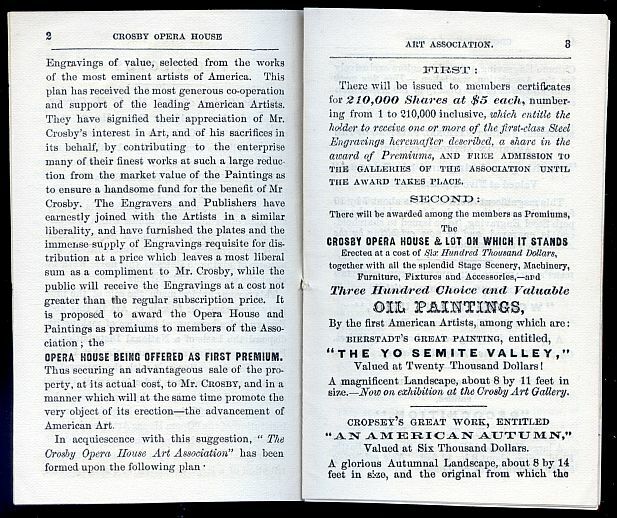 The first four pages of the Crosby prospectus. Figures 7 and 8. The next four pages of the Crosby prospectus. Figures 9 and 10. The next four pages of the Crosby prospectus. Figures 11 and 12. Another four pages of the Crosby prospectus. Figure13. The final two pages of the Crosby prospectus. Figure14. An unsevered pair of tickets. Does anyone know of any others, or any larger unsevered multiples? 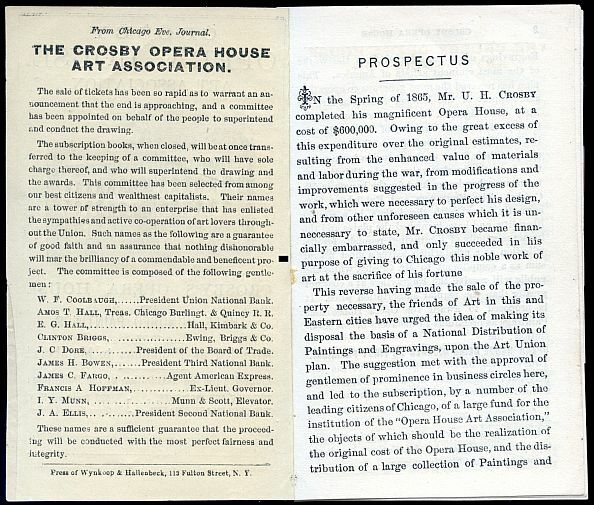 Postscript – A view of the Crosby Opera House before the great Chicago fire. The original article ran in the January – March 1997 issue of The Check Collector.